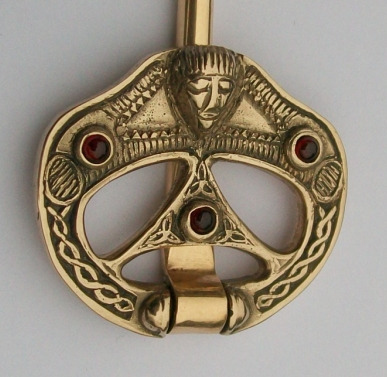 Reproduction of Pin found in a bog in Grousehall, Co. Donegal, Ireland. Depicts a pair of animal heads grasping a human head in their jaws. 8-9th Century AD. In bronze and set with 3 garnets. Width approx 3.7mm, length approx 121mm.